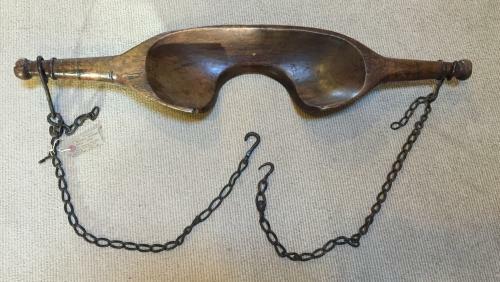 Exceptional Antique Dairy Yoke with original chains and with excellent patination. Often the first tool acquired on a farm they allowed the used to do twice as much, get 2 buckest of water from the well, 2 pales of milk or 2 sacks of grain at one time. The short chain fixings were for carrying things that were bigger such as grain sacks. Yokes were usually a biproduct of the village Wheelwright in winter.